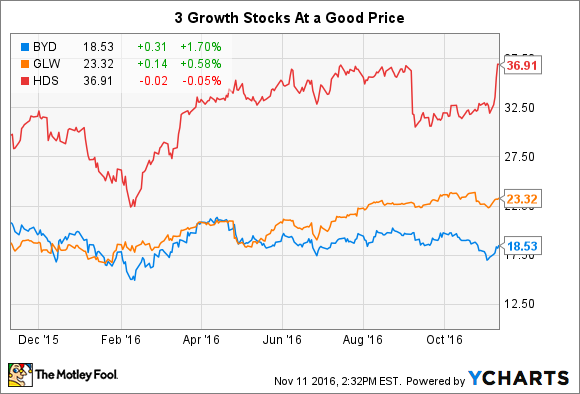 Three quality growth stocks that offer a good value at a good price. It's easy to pick a winning growth stock when the markets are rocketing higher as they were in 2013, for example, when the S&P 500 returned 32.4%. But last year the index was up only 1.4%, and through the end of October the market has only risen 4% in 2016, after putting us all through a few stomach-churning drops along the way. That type of variation validates the investment strategy of buying stocks of good companies with sound businesses trading at reasonable valuations and holding them for years. Fortunately, the sideways market we've been in has given investors a number of opportunities to find companies that meet those criteria, and though the year is getting long in the tooth it's still a good time to buy them to prep your portfolio for long-term gains. There's no single firm definition for "growth stock," but I looked for stocks that had price/earnings-to-growth (PEG) ratios below 1 and were expected to grow their earnings by more than 15% annually over the next five years. "Cheap" is also a term that has many meanings, but I filtered my list for stocks with price-to-earnings ratios of 10 or less. Based on those criteria, here are three growth stocks that look undervalued and provide the opportunity for long-term gains. The Las Vegas Strip receives the bulk of the attention when it comes to Nevada gaming, but off-Strip properties, and those not even in Las Vegas or downtown are a lucrative market, particularly when you compare the costs of building or buying a property there. Casino operator Boyd Gaming (NYSE:BYD) had planned to spend $4 billion constructing the Echelon Place resort on the Strip, but the 2007-2008 financial crisis eventually caused that plan to be scrapped. Instead, the company decided to play the off-Strip market, and this past May, it purchased the North Las Vegas Aliante Casino Hotel and Spa and the Cannery Casino Hotel. It also bought the Eastside Cannery Casino & Hotel in Henderson, Nevada. It paid less than $500 million for the lot. It's almost as if Boyd decided to forego any big name property, because it also ended up selling its 50% stake in Atlantic City's Borgata to partner MGM Resorts. While the Borgata was not a Boardwalk casino, it was the biggest and most profitable one in A.C. Indeed, Boyd has taken to pursuing the locals market in Vegas, and noted in its third-quarter earnings call with analysts last week that the locals business grew earnings before interest, taxes, depreciation, and amortization by 12%, its sixth consecutive quarter of EBITDA growth and margin improvement, and the fifth quarter out of the last six that EBITDA grew at a double-digit pace. Boyd Gaming's stock is enjoying a bit of a bounce in the wake of the report, but with shares down 11% year to date, and almost 20% below their 52-week high, an improving locals market could put the casino operator on a hot streak. After investors ran up the stock of specialty glass maker Corning (NYSE:GLW) through most of the year, they shrugged when the company reported third-quarter earnings at the end of October due to expectations the restocking phase of TV glass panels is largely completed. Because this is Corning's largest operating segment, accounting for 36% of total quarterly revenues, there might not be as much opportunity for additional big gains in the immediate future. Moreover, while volumes for the specialty glass maker were running slightly ahead of the industry, LCD prices are still falling, even if the decline has moderated somewhat. Yet those are really near-term concerns, because Corning continuously focuses on the future, and that's where investors need to look to spot the next wave of growth. Its experiments with ultrathin, shatter-resistant, flexible Gorilla Glass for use in car windshields appear particularly promising, and the joint venture with French automotive glassmaker Saint-Gobain Sekurit it announced earlier this year could ultimately pay off handsomely. There are also advances being made in Gorilla Glass 5 for mobile device cover glass and Gorilla Glass SR+ that's intended for wearable devices. Considering the technological achievements Corning is engineering to ensure it remains relevant to everyday life and use, even with the gains its stock has made over the past year, there is every reason to believe it hasn't run its course, and that its stock has plenty of opportunity for additional large, long-term advances. Industrial distributor HD Supply (NASDAQ:HDS) is another company whose latest earnings report didn't impress the market; it caused shares to turn south after they enjoyed a run up across 2016, though most of the gains came early on in the year. But the setback for the stock caused activist investor Jana Partners to take an interest in its business with an eye toward shaking things up through "strategic alternatives." Its 8.1% stake in the company gives it the ear of management, which said it welcomes the chance to hear from shareholders, but it also means everything could be put on the table. Often times, situations like that lead to a sale or spin off of a division, but in this case, it could include the sale of the company itself. In fact, HD Supply itself is the result of a spinoff from Home Depot back in 2007. While its business is broken into three segments with facilities maintenance and water each contributing around 37% of total revenues each, and construction delivering almost another quarter of the total. Yet the real potential for unlocking shareholder value seems to be through strategic initiatives such as those being advocated by Jana. Not that management doesn't already look in that direction, as it has divested numerous business lines on its own since going public, but with the impetus of an activist investor behind that could fuel a search for a buyer.